Can’t believe it? This spirit has been in Ultimate Frisbee for over 30 years. Interested in learning more about this awesome sport? Check out the Ultimate Player’s Association website. Walker joined the team her freshman year, and despite her hectic schedule of classes, an on-campus job, and other college activities, she continues to make time in her schedule for Frisbee because she can’t get enough of it. “It’s something I really enjoy, and it really serves as my escape from my life,” Allison says. 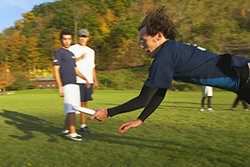 The game is played by throwing the Frisbee between players who attempt to score in their end zones. Positions are divided into two different types -- handlers, who are in charge of throwing, and cutters, who do most of the running. The object of the game is to score by catching a pass in the opponent’s end zone. Games are played until 15 points are earned; halftime occurs when one team scores eight points. 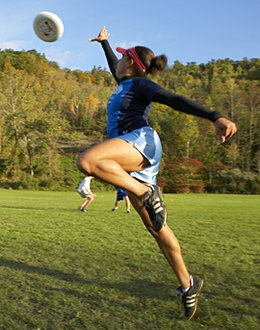 For Ultimate Frisbee players, though, it’s all about what they call the Spirit of the Game. Spirit of the Game places the responsibility for fair play on the players rather than on officials or referees. Spirit refers to the fact that no one governs the game but the players themselves. In Ultimate, it’s all about the honor system. “Since there are no referees, it’s up to the players to rely on their own pride and honor. It’s up to you to call your own foul,” Walker explains. Because of the lack of referees, the aggression level is far less than that in a soccer or football game where there is lots of yelling and screaming. Instead, players play with a mutual love of the game. “You get to enjoy a lot more silliness,” says Walker. One of the fun things the team does is dress up in costumes during their Halloween tournaments. Last year, they dressed up as characters from the movie Braveheart. Ricky Meyer ’09, a cinema and photography major, is cocaptain of the men’s Ultimate Frisbee team, Nawshus. He says that like any other sport, Ultimate Frisbee can get really competitive, but the emphasis on good sportsmanship is what sets it apart. Walker and Meyer both say that their teams are very close. Going away for tournaments on the weekends, sharing pasta dinners, and attending three-hour practices three times a week are all team-building activities on their own. “All of us sleeping on the floor in someone’s house for two nights during a weekend, getting team food, and literally spending the weekend in each other’s company really bonds us as a team. We become so close it’s scary,” Meyer says. Ultimate Frisbee is one of 21 competitive club sports that are active at IC. Walker says that clubs like Ultimate Frisbee are a good option for people who want to stay active but don’t want the restriction of playing a varsity sport. Even though the players' time at Ithaca will eventually come to an end, they will take away something in addition to their degrees -- a love of Ultimate Frisbee.